When one of Oslo’s hottest celebrity chefs is murdered, Hanne Wilhelmsen is called back into action in “a nearly pitch-perfect procedural layered over a moving exploration of rejection and abandonment” (Booklist) in the sixth installment of the award-winning series from Norway’s #1 bestselling female crime writer. On a cold December evening, celebrity chef Brede Ziegler is discovered stabbed to death on the steps of Oslo’s police headquarters, sending a shock wave through the city’s hip in-crowd. Chef Ziegler had many famous associates and more than a few enemies among them. Was his murder a random act of violence, or did someone want him dead? Police investigator Billy T. is stymied by conflicting information about the kind of man Ziegler was. It seems nobody really knew him: not his glamorous wife, his business partner, nor the editor of his memoir-in-progress. The case is hopeless until Hanne Wilhelmsen returns to Oslo after a six-month stay in Italy and teams up with Billy T. Working together, they are pulled deep into the nefarious world inhabited by Ziegler. Was he at all the chef he claimed to be? And can those who knew him be trusted? 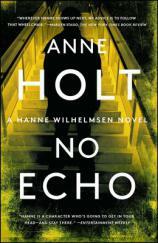 In the fabulous NO ECHO, “transcripts of witness statements alternate with Anne Holt’s penetrating psychological analysis of human desires, weaknesses and essential decency, unveiling unexpected dimensions of her series characters” (Publishers Weekly, starred review).